Have you ever gone down the rabbit hole of information around visual imagery in relationship to recalling of familiar events? If you haven’t, it’s worth your while. One of our first experiences with this in our business is from a painting we procured during our construction phase of our restaurant in 2011. A man randomly came and sold us a painting that he was gifted. The painting remains unsigned and we have never been able to identify the artist. But this painting has hung in our restaurant since we opened our doors 2013. We’ve named her Eloise and she’s been in the subject of many selfies over the years. We’ve noticed that particularly diaspora will come and pick out all the various peculiar symbols in the background. 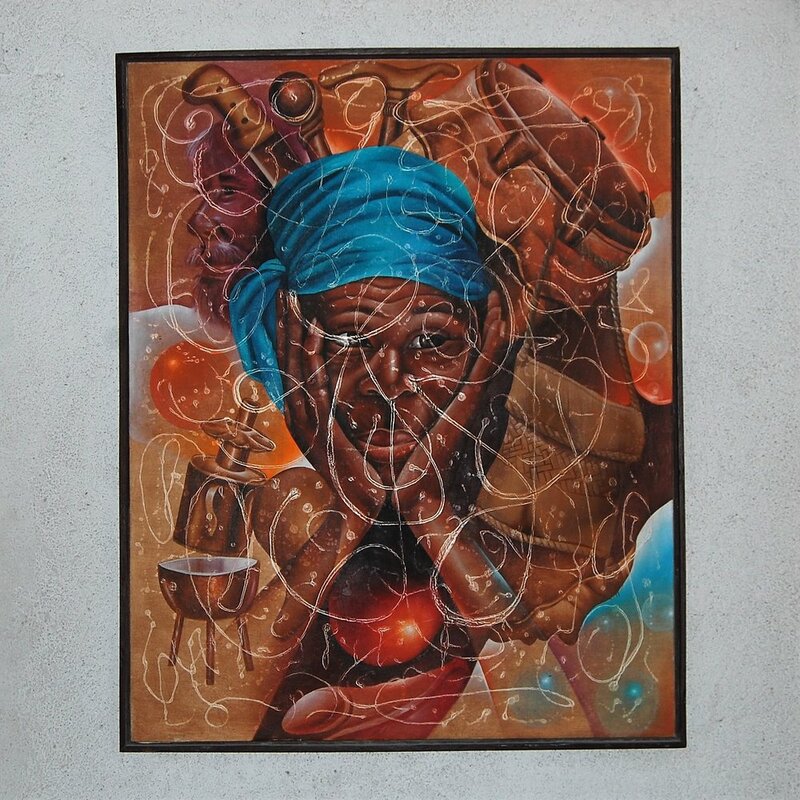 The focal point of the painting is an older Haitian woman with lots of wonder in her eyes. But she’s surrounded by very symbolic Haitian imagery, a three-legged stove, a walking stick, sugar cane etc. Every time we look at it, we find new imagery. This lead us to really understand how powerful the imagery is in our culture is, so we’ve harkened back to that for a lot of product development. Particularly for our line of iced -teas, we pulled directly from imagery in Eloise. Do you notice the drums in the Apre Dans bottle, the three legged stove in the Zizirit iced tea? What imagery reminds you of Haiti?